Committing to a single partner is not a casual decision. Trust is paramount. Reputation, resources, and capabilities are key. We proudly offer our Enhanced EAs (Enterprise Agreements) only to select groups with whom we’ve built a strong base of mutual respect and dedication. Together, we can accomplish almost anything. Defined targets help guide our transition from large execution team to integrated strategic partner. We drive success in each of four main areas. 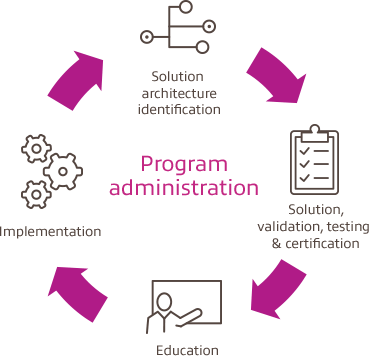 Program administration is central and pervasive, helping us to verify solution efficacy through tracking and reporting adoption rates, cost savings, and key performance indicators (KPIs). Solution Architecture — Collaboratively identify technology solutions that innovate, improve, or remediate business and technology processes. Solution Validation — Validate, test, and pilot solutions in a combination of assessment environments (e.g., lab, controlled clinical setting, etc.). Education — Educate impacted user and operational communities to foster solution adoption and ensure identified business and technology benefits are realized. Implementation — Plan and deploy target solutions utilizing appropriate resources to meet cost and timeline objectives. Our approach becomes realized in a multi-phase, client-focused workstream. Your organizational goals and needs customize the activities, timelines, design, and deliverables. This sets the stage for the work to come. With a group of executive sponsors and business stakeholders, we co-create a vision for what is possible. We begin making the vision tangible by gathering information, pinpointing gaps, and evaluating current state. This critical phase tests the solution architecture – often in a controlled lab setting – to ensure performance. Using the new architecture requires adoption and support on two levels: operational and end-user. With one wave of validation and training under our belts, we deploy the solution in a micro-setting. More than simply turning a switch, this phase requires tight coordination of resources and specialists. Transition from project to new environment. Position owners in more permanent roles with defined responsibilities. This is the start of an ongoing feedback and modification loop for continual process improvement. Proven and customized tools offer insights to drive innovation and transformation. Experience a simplified, managed environment built for your organization. Our mature and differentiated Cisco partnership brings immense value to our clients. Not long ago, a multinational conglomerate with commercial, consumer, engineering and aerospace divisions sought our help in meeting new compliance demands. Though the firm solicited guidance from a number of other potential advisors, they opted to work solely with us. Today, they are eager to share how our program accelerated technology integration, prioritized their business needs, and enabled rapid evolution.